In this instructable, I will try to make an in-depth and comprehensive guide to the different types of heating and lighting products that are available in the pet market. Gather as much information as possible on a reptile prior to purchasing it so you will be prepared to meet the specific lighting and heating demands they require. Proper planning will result in a happy and healthy reptile and will lead to less health problems. Step 1: What Is It All For? For reptile owners, there are many options available to provide a reptile with it's proper lighting and heating needs, and the challenge is to put together a system that both fits the needs of the animal and the owner's budget. Light is important because it helps to regulate the pet's sleep cycle and mating habits and helps maintain the health of the animal. Heat is important since it helps to maintain the reptile's body temperature and aids digestion. Prior to purchasing a new pet, it would be smart to read up on the animal's specific needs, since they are all different. Check the library or helpful guides on the internet, ask questions at the pet store and try to get everything ready before you bring your new friend home. Exotic reptiles and amphibians come from all over the world and re-creating their specific environment is important and sometimes challenging. The goal is to get everything just right, which will lead to a long, healthy life with few vet bills. And, with a little planning and forethought, a healthy habitat can be achieved. Along with good food and proper husbandry, adequate light and heat are essential to your pet's health. Making life easier on the owner is what it's all about. Reducing certain variables helps to take out a lot of guesswork when setting up a place for your pet to live. A simple light timer is an easy and inexpensive way to automate the on/off cycle of your various gadgets. They can be purchased from a hardware store, a pet store or online. There are a vast amount to choose from, ranging in cost from cheap ($5 US) to pricey ($50 US to $100 US or more). For most simple setups, a cheaper hardware store timer will do the trick. They are used to turn a device on and off at certain times of the day or night, such as a lamp or holiday decorations. With these, you can determine what times the lights and heat turn on and off for the day. It's a lot simpler than remembering to turn a switch on and off every single day. Plus, several exotic species are very dependent on having the proper light/dark cycles and timers are an easy solution. A thermometer (or several) helps you to inspect for the proper heat in various areas of the reptile's enclosure. Since reptiles are cold-blooded and must regulate their own body temperature, a warm area and a cooler area within the enclosure (aka a "thermal gradient") is essential. With thermometers, you can quickly glance at an area of the cage, decide whether or not the temperature is sufficient and make changes if necessary (such as moving a light to a different angle or replacing it, moving cage decorations around, and turning the heat up or down). Typically, one should be placed in the warmest area of the cage and one at the coolest area. Prior to getting a reptile, you should try and decide what species you want and what the enclosure would be like. Buying or building an enclosure will wind up being cheaper over the long-term when you plan for how big the animal will grow and purchase the proper-sized enclosure to accompany that. It will decrease the amount of times you will have to upgrade. Once you have that out of the way, the next step is to plan on how the enclosure will be lighted and heated. However, there are many other options that can be considered, especially for larger animals (monitor lizards, boas, pythons), animals with long life spans (tortoises, lizards, snakes), or ones with very specialized habitat needs (frogs). A good thing to do in the beginning is to consider the habitat needs and life span of the animal and to compare prices. Over the long term, for example, incandescent bulbs might wind up being more expensive than a variety of other setups. Electric companies charge you by the number of kilowatt hours (kWh) used. Calculating the amount of energy that you will use per day, month and year is useful when comparing options. d = this is the answer. It will be the amount of kilowatt hours per day that you consume to power the setup. 1 (15/1000) x 14 = 0.21 kWh/day. Take both answers and add them together (1.44 + 0.21 = 1.65) So, the whole setup uses 1.65kWh per day. You can then take that figure and multiply it by whatever amount of days that you want to arrive at the answer of how many kWh's it will take to run the setup for a specific amount of time (such as a week, a month, or a year). Using this equation will help you easily compare the energy needs of any setup. You will want to choose the setup that will best benefit the animal while saving you the most amount of energy (thus saving you more money). Rheostats and thermostats are useful devices to use for a reptile enclosure. They can help to regulate and fine-tune the amount of light and heat within an enclosure. A rheostat and a thermostat are different from one another. While a thermostat can be used to turn a heating device on and off when the cage reaches the proper temperature, a rheostat can act as a dimmer, thus increasing or decreasing the amount of power going to a certain device such as a light or a heating device. Thermostats are useful since they will not allow the enclosure to get above a certain temperature wherever the sensor is placed. The thermostat is set to a certain optimum temperature, the sensor is placed somewhere inside the reptile enclosure and it will cause the heating device to turn on or off to maintain the proper temperature. These are useful in something such as some amphibian tanks when the animal does not require a large thermal gradient or to bask, but needs an overall temperature maintained. You would not want to use a thermostat when controlling a device such as a light since it will cause the reptiles natural day/night cycle to become confusing. You would also not want to use this with something such as a heat mat, heat cable or heat rock. If the reptile is intended to actually lay on or touch the heating device, using a thermostat will cause the device to become too hot, potentially burning your animal. A better device to use where the animal is intended to touch, lay under or lay on a heating device is a rheostat. The rheostat can be turned up or down like a regular household dimmer switch to regulate the amount of electricity that is distributed to a particular device. This will cause the heating device itself to maintain the proper temperature. Once it is adjusted properly, the heating device will not be able to become too hot and burn a reptile. Simply use a thermometer to measure the temperature of the device and turn the rheostat up or down until the device maintains the proper temperature to suit your reptile's needs. Rheostats can also be used for some types of lights to increase or decrease both the heat and light output much in the same way that they are used for heating devices. They are most commonly used with incandescent bulbs and fluorescents made specifically with a dimming feature. They will not work on fluorescent bulbs that do not have this feature. Also, like standard household lights, they can reduce the life of the bulb. The trick with rheostats it to use them to control similar devices. You could use them to control two of the same lights or two of the same heating devices, but don't use one rheostat to control a light and a heating device. Finally, decide exactly what the thermostat or rheostat will be controlling in your setup and calculate the total amount of watts. Thermostats and rheostats are rated to only handle devices up to a certain wattage, so buy the right kind the first time or else they will get burned out and will need to be replaced. In this section, I will try to cover the many types of lights available in the pet market. Consult books, internet guides and the seller to determine what your pet will require, since all reptiles have different needs. Try to consult a few different sources of information so you will get an overall idea of what to buy and how much. When considering what type or types of lights to buy, keep in mind the frequency that you will need to change them. Fluorescent lights last longer leading to less money spent over the long-term than incandescent lights, but offer no heat. Incandescents burn out faster, but also supply heat. Using the equation in step 4 will help to give you an idea of how much power you will use. Also, decide on what will be safest for the animal. If the light has to be inside of the reptile enclosure, then consider fluorescent lights since incandescents can burn the animal if it touches it (like an iguana or a snake). If the light will sit on top and shine down, then an incandescent would work since there is no danger of the animal touching it. Do not use regular lights from a hardware store! Reptiles use the light to help keep their bones strong and to regulate their metabolism. Specialized lights made for reptiles supply them with the proper amount of UV (ultraviolet) light that they cannot get from a standard light bulb. The cost of using a standard light bulb is great, because it will lead to vet bills and possibly the death of your pet. Look for lights that have acceptable levels of UVA and UVB rays for your animal. It's an in-depth description of reptile needs regarding UVA and UVB light, and the types of bulbs that produce the best results. Daylight bulbs mimic the sun. In nature, the sun provides reptiles with the proper balance of UV light and heat that they need to stay healthy. In an enclosure, it is necessary to re-create that. The most common way to do that is to use an incandescent daylight reptile bulb. One of the good features of these bulbs is that they come in many different sizes and wattages from 15 to 100+. They will heat your cage as well since incandescent lights produce heat. Lights like this are typically placed over the cage in a reflective dome enclosure to mimic the sun's rays coming down to light and warm the cage. Usually, these are the only device needed for beginner-type reptiles such as anoles, some geckos, corn snakes, etc. However, the lights can be potentially dangerous when used inside or too near the enclosure. If a snake or lizard were to touch the bare bulb or get too close, they can suffer a burn the same way humans would when touching a hot light bulb. If you absolutely must have an incandescent bulb inside a cage, use a dome enclosure and make sure the animal cannot climb on top of it (heat rises). Consider (heavily), purchasing a screen made to go over the open end of the dome enclosure to prevent the animal from crawling inside. Also, if the light were to be placed too near to an enclosure, it might cause it to become too hot for the reptile. This can be fixed by selecting a bulb with the proper wattage and monitoring the temperature inside the enclosure. A good indication that it is too hot or uncomfortable would be if the reptile is always found in the cooler areas of the cage (under a rock, in a shadow, in the water dish). Fix this problem immediately either by moving the light further away or purchasing a bulb with a lower wattage, since high temperatures will indeed cook your animal. Another way to adjust the light and temperature would be to control the lights with a rheostat. Since the rheostat acts as a dimmer, it can reduce the amount of light and heat. However, just like a standard light bulb on a dimmer switch, it might make it more likely to burn out faster. A good cycle for these lights would be roughly 12 hours on/ 12 hours off per day. However, some exotic reptiles may require more or less light. To more accurately reproduce their home climate, research the species' place of origin and the climate there. Try and re-create the amount of light in each season and the average seasonal temperature. This will require a little extra work on the owner's part, but the result will be a healthy and happy pet. If the pet is nocturnal, it is still important to recreate the proper daylight/heat cycle. The absence of this is what triggers the reptile to begin its nighttime activities. For the energy-conscious or cost-conscious reptile owner, these lights might be considered wasteful. They can cost in range from $6 to $20US and burn out within a few months while consuming large amounts of electricity. A more cost and energy-efficient setup would consist of a fluorescent light and a heating device. Basking lights work in much the same way that a daylight light works. They are specialized to provide the proper amount of UV light, but basking lights are used primarily when trying to recreate a hot or desert-type environment. Animals such as some tortoises, iguanas, monitor lizards, bearded dragons and certain snakes benefit from basking lights since it is meant to re-create what the sun does in a tropical or desert-type environment. In nature, the sun comes out and warms up the earth's surface such as a rock or the branch of a tree. The reptile lays on it and absorbs the heat from the earth and the sun. Basking lights are commonly used in conjunction with daylight bulbs. The daylight bulb is there to provide the overall lighting of the cage while the basking light is used to warm a specific portion of the cage such as a rock or a piece of wood. Basking lights are also commonly controlled with a rheostat since the intention of a basking bulb is to focus a large portion of heat onto a small surface, thus recreating an area that the animal would use to bask in nature. The rheostat can help to adjust the amount of heat the basking light produces, making it less likely for the animal to get burned. Buying a basking light with the least amount of wattage that you will need and fine-tuning the temperature with a rheostat will produce the best results. Since desert animals are attracted to areas with higher temperatures, it is important to prevent the animal from getting burned. If the basking bulb has to be inside a reptile enclosure, make sure that the animal cannot climb onto it or touch it, since basking lights get very hot. If using a reflective dome fixture, consider buying a screen that fits over the open end of the fixture. If the reptile is nocturnal, then these lights are probably not necessary since the animal will most likely be hiding or resting during the day and not basking. It is still important to recreate the proper light/heat cycle for the animal, since the absence of these is what triggers the animal's nighttime activities. Because of the special function that basking lights provide, there is no fluorescent equivalent like daylight bulbs have. They simply do not put out enough heat. Energy and cost-conscious reptile owners might want to employ some other heating device instead. Night bulbs are primarily used to provide hot or desert-climate reptiles with the heat that they require in the night. They are also handy to observe a nocturnal reptile's habits after the "sun" goes down. These lights are commonly red in color. They give off the heat that the reptile needs throughout the night while producing infrared light which is invisible to the reptile, thus allowing the animal's natural nighttime habits to be observed. When these lights are used in conjunction with a daylight bulb and/or a daytime basking bulb setup, they can be less wattage than their daytime equivalents. Since the absence of light and the cooler night temperatures are what trigger the nocturnal reptiles to begin their nighttime activities, the cage will not need to be as hot as it was during the day. Controlling a night light with a rheostat will help to maintain the proper temperature throughout the night while allowing it to be observed. You don't have to have lights like this if you do not wish to view your animal during the night, but if your animal requires heating during the night then it is necessary to use some sort of device to provide it. Remember, the red light is invisible to the animal - only the heat it provides in important. The red light is merely to delight the nocturnal reptile owner by being able to get a closer view of their habits. If the animal is nocturnal, but does not need much or any heat during the night, halogen and fluorescent equivalents are available. Set these lights to come on when the daylight bulbs go off, otherwise they may cause the enclosure to become uncomfortably hot. For the energy and cost-conscious owners, using a halogen or fluorescent bulb in conjunction with a heating device might prove to be more efficient than an incandescent setup. Moon lights are another type of specialized nighttime light. They simulate the natural glow of the moon, allowing nocturnal reptiles to carry on their nighttime activities. Some nocturnal reptiles cannot hunt in the complete "darkness" of an infrared light, but they still may require the simulated residual heat left by the sun. Using a moon light would provide them with the low level of light and the heat they need in order to hunt, eat or reproduce properly. Other nocturnal animals may require the moonlight to see but not the heat. In this case, an equivalent fluorescent or LED moon light would work. Same as with infrared bulbs, choose a light with the lowest wattage necessary to provide the proper amount of heat and light and fine-tune it with a rheostat. And, if it must be used within the enclosure, be sure to prevent the animal from touching it. Energy and cost-conscious owners may want to incorporate a fluorescent or LED light with a heating device. Using fluorescent tubes to provide light in a reptile enclosure is also popular. Lights such as these are also commonly seen in most aquarium setups. Specialized fluorescent tubes are available for reptiles as well. Be sure to purchase a type that emits the proper UV light spectrum for your animal. Fluorescent tubes are usually cylindrical with pins on either side that slide into a hood or other fixture. They are only useful to produce light since they do not put nearly as much heat as an incandescent bulb. Heating devices are necessary when using these types of lights. Even though they do not get hot, if they are used within a cage, the reptile must be protected since the glass can still shatter easily. Consider purchasing a fixture with a clear protective plastic cover over the bulb. To the best of my knowledge, lights of this type are not dimmable, meaning that they do not need to be used in conjunction with a rheostat. Select the proper sized bulb to properly illuminate your enclosure either for daytime or nighttime use. Fluorescent tubes are usually of a lower wattage than incandescent bulbs, making these an option for the energy-conscious pet owner when paired with some type of heating device. Compact fluorescent light bulbs (CFL's) are fairly new to the pet market. Since they are relatively the same size and have the same base as incandescent bulbs, they are a good lower-wattage replacement. However, just as with fluorescent tube lighting, these will not provide the enclosure with the proper amount of heat. A heating device will be needed when using fluorescent lighting. Since they are available to replace daytime and nighttime bulbs, they can be useful in helping to reduce electricity demands of a reptile enclosure. However, since incandescent basking lights are used to focus light and heat onto a surface, consumers should be skeptical with fluorescent lights that claim to be "basking" lights. CFL's produce little heat and should be used in conjunction with other heating devices. Also, most (but not all) CFL's are not dimmable, meaning that they are not able to be used with rheostats. If a CFL is labeled as "dimmable" then it is OK to use with a rheostat. Choose a CFL with the lowest wattage while still providing the proper light output for the reptile enclosure. Energy and cost-conscious owners might want to consider using these types of lights in their setup. They use far less energy and even though the up-front cost of these lights can be greater, they last much longer, leading to money savings over the life of the reptile. Halogen lights are also used in reptile enclosures. Like fluorescent lighting, they produce less heat than incandescent bulbs. Unlike fluorescent lighting, halogen lights can be dimmed, meaning that they are acceptable for use with a rheostat. Halogen lights usually have two pins in the bottom and need to be used with a proper halogen lighting fixture. They are available for daytime and nighttime use. Make sure that the type of halogen light purchased provides the enclosure with the proper amount of UV light. Monitor the temperature of the reptile enclosure to determine whether or not additional heating devices are necessary. And as always, if a halogen lighting fixture must be used within a cage, make sure that the reptile cannot climb on it. Like CFL's, LED's (Light Emitting Diodes) are also fairly new to the pet market. When choosing any type of LED fixture or replacement bulb, make sure that they provide the proper spectrum of light and that whatever fixture or replacement used, they will give enough light to light the enclosure. Since LED's give off no heat at all, it is necessary to use these types of lights in conjunction with a heating device. Energy and cost-conscious owners may consider using LED lights in their setups. LED's consume the least power of all lighting options, typically 5 watts or less. They also last the longest, leading to money savings over the life of the animal. In this section, I will try to cover the many types of heating devices available in the pet market. Prior to buying a new reptile, be sure to consult books, internet guides and the seller. Check a few different sources so you can get an overall idea of your pet's heating needs. When considering what type of heating device to buy, also consider how your animal may behave, the animal's size now, the animal's adult size, the placement of a heating device within the enclosure and the temperature you wish to maintain. Luckily, there is a wide variety of different heating devices available for a wide range of habitats and needs. Why is heat so important anyway? Reptiles are cold-blooded. They need the heat to help regulate their metabolism and to gain energy. Natural increases or decreases in heat can trigger hunger, mating habits, sucessful births, the beginning or end of a sleep cycle. Reptiles rely on heat in nearly every part of their lives which is why it is so important to provide them with heat and at the proper level. Be careful! Follow all manufacturer's directions for the type of heating device you are using. Do not modify them. If they become damaged, then replace them. Monitor the temperature carefully, since most heating devices have the power to burn a reptile if not used properly. Decide if you will need a thermostat, a rheostat or both and purchase them as well since many of these devices are intended to be used with them. Aquarium heaters are available in many shapes and sizes. They are usually made to be submerged in water up to a certain amount of gallons and they have a built-in thermostat that will turn them on and off to maintain optimum water temperatures. Heaters like this are only useful in an aquatic or semi-aquatic setup, typically for frogs, newts and turtles. Be sure to follow all directions that come with your aquarium heater. Also, be sure that the placement of the heater in your enclosure will not lead to burns, since these can become very hot - even underwater. Heaters such as these usually have a built-in thermostat or other temperature control system, if not, then they must be controlled with an additional thermostat. And, since the intention of these devices is to maintain the overall temperature of water in an aquatic system, it is better to control them with a thermostat than with a rheostat. Heat mats or heat pads are one of the most commonly used products to boost the heat in a specific area of an enclosure. They are typically adhered to the bottom of glass aquariums and deliver heat from the bottom up by warming the glass. Heat mats come in a variety of sizes to suit nearly any aquarium setup. Just like any other heating device, they may become too hot for the reptile, making these good for use with a rheostat. Then, they can be set to maintain the proper temperature. And, like any other product, you must follow all directions and precautions for installing one in your setup. Usually, heat mats cannot have the aquarium resting directly on top of them and some manufacturers include small rubber feet that adhere to the bottom of an aquarium. Most heat mats are not made for use within reptile enclosures as well. Buyers are also cautioned to not use them to heat up water or thick layers of substrate. If you adhere a heat mat to an aquarium, you should not try to remove it and use it again on another aquarium. Heat mats usually last a long time and run on small amounts of energy, making these good choices for energy and cost-conscious pet owners. Radiant heat panels function in a similar way to heat mats. But, where heat mats transfer heat up, radiant panels are made to transfer (or radiate) heat down or to the side. Another good feature of these is that some are made for use inside of a reptile enclosure. They can be controlled with a thermostat to help maintain the overall temperature of an enclosure or with a rheostat to provide hot-climate reptiles with an area to bask. Some radiant heat panels may have a thermostat or rheostat built in already, but if not, then it is a good idea to control the temperature with the proper device. Same as with any other heating device, check and be sure that the area or the panel itself does not get too hot to burn the animal or create an unhealthy level of heat. These types of heaters typically last a long time and there are some good companies online that carry them. They also use less power than other popular heating devices, making radiant heat panels a good choice for energy and cost-conscious pet owners. Some companies will even guarantee their product and offer warranties. Before investing in these, it is good to shop around for a product with the best cost and quality. Heat cable or heat rope is another common heating device. What makes it so popular is its versatility. Heat cable is simply a flexible wire that gets warm. It can be used both on the outside and inside of an aquarium, and it can be wrapped around a rock or piece of wood to create a warm and relaxing space for an animal. Heat cable comes in different lengths and is useful to heat one or several enclosures at once. But, heat cable cannot be used alone since it gets too hot. Heat cable temperatures must be controlled with a rheostat. Before installing a heat cable in a reptile enclosure, test it out first and get the temperature right. And, if using heat cable within an enclosure, make sure to not wrap heat cable around on itself since this may cause it to melt. Since heat cable is so versatile and it uses a small amount of electricity, this is a good choice for energy and cost-conscious pet owners. *NOTE:* Heating cable is also available from hardware stores as a way to keep pipes from freezing or to melt ice on a roof or sidewalk. Sometimes, heat cable such as this is adapted for reptile enclosures even though that is not the intended use. If you are going to use this, be very careful. Control it with a rheostat and follow all directions. I consider using this to be potentially dangerous, but it has been done. Proceed with caution. Heat tape (most commonly referred to by it's name brand "Flexwatt") is another common product used with reptile enclosures. This functions much in the same way as heat mats do since it provides heat from the bottom up, but it can provide you with a lot more versatility. Heat tape comes in different lengths and widths, so it makes it easy to heat large areas or multiple enclosures simultaneously. Simply choose the length and width you need. A word of caution: Flexwatt heat tape was not made with the intention of using it for reptiles. Flexwatt heat tape is for heating pipes and drums. Reptile owners have adapted it for their setups with success, but as with all heating devices, you must proceed with caution and safety. Why safety? Because you will have to make this. Some reptile companies who carry heat tape will assemble a mat for you according to your specifications, but some people choose to make it themselves. And heat tape gets very hot. You must control this with a rheostat. Heat tape can be a good choice for energy and cost-conscious pet owners since it is versatile and you have a lot of control over the size, but with anything that is adapted for reptile use, proceed with caution. Ceramic heat emitters are popular choice for reptile enclosures. They can fit into a common light socket and radiate heat to wherever it is pointed. It is basically a heating coil cast in ceramic that heats up and radiates heat to a surface intended for the reptile to bask in. Most of the time, they claim to also provide your reptile with infrared light as well. Ceramic heat emitters get very hot and can burn skin on contact. When using these on or inside an enclosure, make sure that no people or pets can touch this accidentally. These are commonly used within dome enclosures, and purchasing a wire protector that fits over the open end would be a good idea. It is probably not a good idea to use this within the enclosure itself, but if it must be done, make sure the reptile cannot climb on it or touch it. I would also recommend not using this near water or where water can be splashed onto it, since this may cause it to crack. Don't use these if they are cracked, and control these with a thermostat or rheostat, depending on your cage's needs. Energy and cost-conscious owners may want to stay away from products like these, since they use as much energy as a regular incandescent light bulb. However, they don't need to be replaced as often as incandescent bulbs, since these do last a long time. Hotot rocks are used often in reptile enclosures because it provides a reptile with a warm place to lay on. However, these products have gotten a bad reputation for burning reptiles over the years since they are so commonly used. This is due to the fact that they are sometimes used inappropriately. Hot rocks are basically a heating coil that is cast into a shape (commonly in ceramic or resin) to resemble a rock, cave or a log. They heat up and the reptile lays on it to maintain its body temperature. Depending on the size of the animal, hot rocks can be purchased in many different sizes, allowing you to tailor it to your specific needs. The bad reputation for burning pets comes from the fact that these can become very hot when not used in conjunction with a rheostat. They are also prone to crack when dropped or when wet. Many newcomers to reptile ownership will simply plug this into the wall which will cause it to become too hot and burn the pet, or they will place it on moist substrate which leads to cracking and exposing the bare heating element which will cause a pet to be burned when it touches it. You can avoid this easily by keeping these in a dry area of the cage and by controlling the temperature with a rheostat. Always follow the instructions on the package. Using electronics to duplicate any reptile's natural environment is tricky. And, what makes it even trickier is the way that some products on the pet market are misleading. There is very little regulation and almost no repercussion when a company puts out inferior products. So, do a little homework when shopping. Ask questions to other reptile owners and find out what they use. Find out what they hate. Ask around and ask more than once. There are hundreds of web pages and reptile discussion boards online as well. Read and participate in discussions on products in the pet market. Learn what to buy and help others do the same. And, most importantly, follow directions! Don't use products in a way that they are not intended. 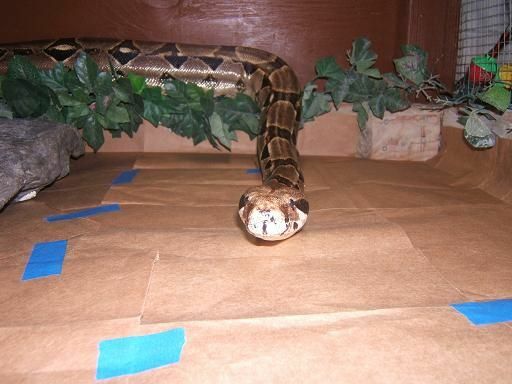 Take care to inspect wiring that is involved with your reptile enclosure. Not only will your pet be safer, but so will you. Fire prevention is an easy habit to practice. With this hobby - good information, reliable products and safety go hand-in-hand. Step 24: So What Does Ipodguy Use? I have had all kinds of exotic pets and I've used or at least tried nearly everything on the market. Currently, I have a leopard gecko and two large boa constrictors. The gecko uses the simple setup that I explained earlier. A 60W incandescent Daylight Blue reptile bulb provides it with both heat and light. The boas each have their own space, and each has a 20W CFL Daylight reptile bulb and a 15W heat cable. The sheer amount of options that reptile owners new and old have can be confusing and sometimes misleading. I hope that this guide helps you to better understand the products out there and that it helps to better plan a heating and lighting system. I wanted to explain these different products objectively and create a comprehensive guide to the many gadgets out there while explaining the pros, cons and cautions of each. I'm always interested in finding out about new products on the market and learning more about the ones that have already been around. So, if I missed anything or if you have something to add, please leave a message in the comments section so I can read it. If you have any additional questions, feel free to ask and I'll see if I can find an answer. Thank you for this incredibly specific and informative post! I've been researching vivariums on and off for 3 years and have really gotten into it the past few months. I have a question about lighting for you, I want to get a chameleon. I am in the process of finding a china hutch which I plan on taking glass out of, replacing with screen, waterproofing interior, yadda yadda. I found a hutch that I think is perfect. 32"×19" and 80" tall. My main concern before purchasing it, with such a great height, should I be getting more than one set up of bulbs? Installing possibly a second set in the middle somewhere or with the right wattage, do you think one set up would be enough? Do you have any recommendations for what wattage i should go for considering the size of terrarium? Thanks again for your post, many people seem to bypass lighting in all their terrarium builds, this was extremely informative! I need help. I just got my first pet reptile 2 weeks ago, she is a Leopard Gecko. I did my research and had the tank setup before I got her (although to be honest I only finished setting it up a few hours before she arrived). I have a 16w heatmat under the tank with an inch of cocofiber substrate inside. I also had originally hooked up a 100w thermostat to control the heatmat and set it to 90 degrees Fahrenheit. The tank never came above 80 degrees. So I then turned up the thermostat as high as it would go which was 95 degrees and the tank only rose to 85 degrees on the hot end. I then ordered her a new thermostat of a different brand that had been recommended by a reptile expert whom I follow on YouTube and I set that up yesterday and set it to 90 degrees. The tank was at 71 degrees this morning so I turned it up to 100 degrees. When I left for work this afternoon the tank was at 72 degrees. What am I doing wrong? Here are my thoughts. It sounds like you are trying to create a temperature gradient which is good and it’s great to hear that you did some prior research. First, you could supplement the heat with an incandescent light on top of your tank. However, one thing I noticed is that you said your heat mat is hooked to a thermostat. The way a thermostat works is that it turns the mat on when it falls below your set temperature and off when the temp rises above your set point. So it’s an on/off/on/off cycle and your temp is going to fluctuate as the space heats and cools. Instead of the thermostat, consider trying a rheostat. The rheostat works more like a dimmer switch. It will supply the mat with constant power instead of on/off like a thermostat, and you can use the dial to control the voltage and maintain it at the temperature you choose. It will also work in conjunction with a light timer, so you can recreate the effect of nature cooling down at night when the sun’s gone if you need that. Last, double check the thermometer you are getting your readings from just to make sure that it’s working properly and you can rule that out. That’s my opinion and where I’d start if I was having a similar problem. Good luck! We just purchased a bearded dragon & it's about 4 months old. We currently have it in a 40 gallon tank. Is this okay? What is the proper lighting for it? I have a leopard gecko in a 10gal tanks im having trouble getting the tank to get the desired temp of 90°. I have the heat pad attached to the side of the tank. Would this make a difference? Help my baby need heat. If you have a wooden tank don't put the heat mat on the side as heat does not transfer through wood, if it's glass then that will be better. When it comes to heat mats though your best option will be on the bottom of the tank, if glass place it on the outside under the tank on one side, if wooden it will need to be on the inside of the tank and tucked under the substrate whether it's reptile carpet/tiles etc. Just be sure to monitor the temperatures within the tank, i'd recommend a heat gun (basically a handheld laser pointer with a heat sensor on it). This will be more accurate than the small colourful thermometers you find at pet stores because you'll need to measure the ground temp rather than air. Hi i would like a leo and i have a tank i was just wondering if people do a battery power one if so could you alert me. i need a battery power one as there is no main plug near where the tank Has to be please help. You should probably get a black light, which is a UV heating lamp, and you could leave it on in the night, keeping the tank warm. A cover tends to help keep in heat as well. You could put both lights on one side of the tank and put a thermometer there to measure the difference in heat for different parts of the tank. hy i have Bartagamen and i try to get the terrarium comfortable for them. Heat from the ground was not good because they dig in . Im not ready but maybe you take a look.i wai t for the light sensor to check uva/b. do not use heat rocks. they can seriuosly injure or kill the snake. Well, If i have a cold snake, I now know what to do!